The Fremantle Network is taking on a different format with Politics in the Pubs this Tuesday August 28 in The Garage at The Local hotel in South Fremantle at 7pm. Members of the Fremantle Refugees Rights Action Network-RRAN will start the discussion to explore the challenges, complexities, concerns and compassion of dealing with refugees. I am disappointed that the Fremantle Network is changing, as it was always good to talk about Fremantle specific topics once a month. The Politics in the Pubs will no doubt largely be about federal politics, instead of being about the governance of Fremantle and WA, with topics closer to home and to our hearts. The lines about refugees are clearly drawn in Canberra with the Liberal/Nationals wanting to stop the boats and the Labor party not having the guts to have different policies. I am personally very disappointed and disgusted about Australia’s lack of compassion for boat people and refugees because a rich and huge country like ours could offer safe haven to many more desperate people. Many people in Fremantle will be interested in this so hence the announcement that a RALLY FOR REFUGEES will be held tomorrow Saturday July 21 at Forrest Place in Perth from 1-3pm. I found the way Australia treats refugees disgraceful and am very disappointed that the major parties support overseas detention centres, so there is little hope the Labor party would change the policy should they win the next federal election. If the refugees where white Christians they would not be banned from Australia, but skin colour still makes a huge difference in Australia. Fremantle people will meet at 11.30am tomorrow at Pioneer Park opposite the train station to join the Perth Palm Sunday Walk for Justice for Refugees. The Perth march starts at 1pm from St George’s Cathedral on St George’s Terrace, so our Freo attendants will hop on a train to march with them. Many hundreds of people marched through the Fremantle CBD at lunchtime on Saturday during the FREO SAFE HARBOUR rally, demanding the closure of detention centres and an end to off shore processing, and a more humanitarian approach toward refugees by the Australian government. It looks like it is going to be the kind of day to cuddle up with a good book, eat hot soup and enjoy a nice glass of mulled wine, as the clouds are pretty dark and a heavy shower just rolled over Beaconsfield. I took these two photos in Fremantle port around 6.40 am this morning and it was cold with a strong easterly blowing. If the clouds break up and the rain stops, or if you are truly dedicated, join the Freo Safe Port refugee rally at Pioneer Park. It starts at noon! City of Fremantle Councillors, staff and the community will show their support for refugees by marching in the annual Palm Sunday Walk for Justice for Refugees this Sunday 20 March. The group will gather at 11.30 am at Pioneer Park (opposite Fremantle Train Station) and board a train to Perth to join the main event at 1.00 pm outside St George’s Cathedral. Fremantle councillor and refugee rights advocate Cr Sam Wainwright said the Walk For Justice aimed to shed light on the injustices refugees face when attempting to seek refuge in Australia. “Overwhelming evidence indicates severe and systemic abuse of asylum seekers’ human rights is occurring within Australia’s immigration processing system,” Cr Wainwright said. “We’ve seen a recent surge of concern about the conditions in Australia’s offshore detention centres in particular as a result of the impending deportation of 267 asylum seekers. A lot of this attention was focused around the fate of “Baby Asha”, who doctors in Brisbane only agreed to release on the condition she would not be returned to Nauru. “It’s completely unacceptable to detain people like this and I’m really proud of the actions the Fremantle council has taken recently to help defend the rights and raise the profiles of these innocent people. “We’re now calling on our famously compassionate local community to stand together to support refugee rights by attending the march with us,” Cr Wainwright said. A large crowd turned up on Sunday for the annual REFUGEES FIESTA at the Fremantle Esplanade. Whadjuk Nyoongar Elder Theresa Walley gave a welcome to country while Deputy and Acting Mayor Josh Wilson welcomed the people to the city. There was a drumming circle and food and information stalls and live music entertainment after the march through the inner city. 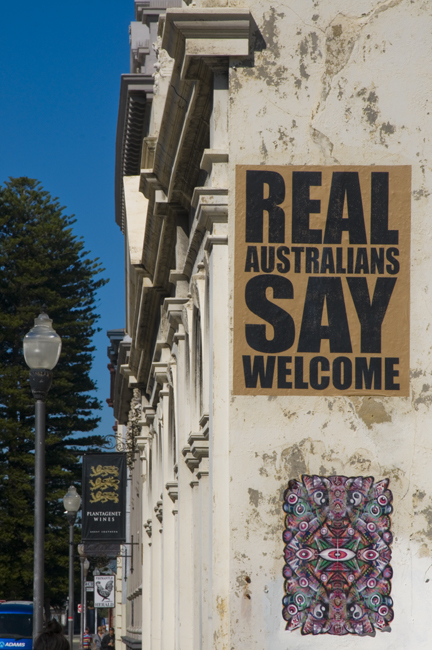 This welcome to country sign on the ‘wedding wall’ at Fremantle’s Cliff Street is a welcome reminder that Australia embraces multiculturalism and immigration and that we are not a mob of racist bigots. On June 14 the annual Refugees Welcome Fiesta will be on at the Esplanade, so come and say hello to new Australians and get to know them. 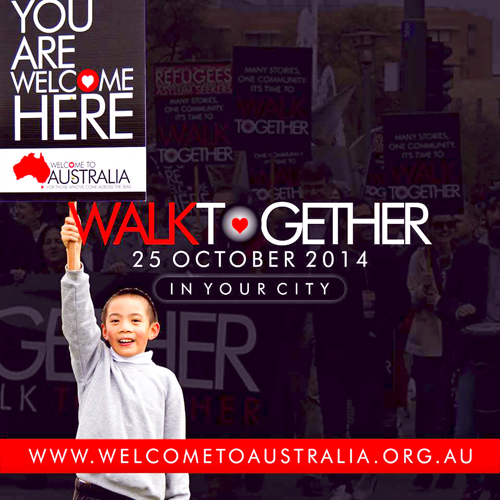 I realise I will be criticised for being a loony Fremantle ignorant, left wing, do-gooder for promoting the WALK TOGETHER event on October 25, but showing more compassion to asylum seekers and boat people is something I am very passionate about because I believe we need to share better with those whose lives are threatened or who live in poverty. I watched part of a doco on how Italy deals with boat people and the humanity of it made me feel ashamed about how Australia treats these people. Anyway, check out where the events are held all over Australia on my birthday on http://www.welcometoaustralia.org.au.